At our conference last week Claire Baker MSP launched her proposals for a Bill to amend the law of Culpable Homicide to ensure families who lose loved ones through the reckless or negligent actions of company bosses and the company itself get the justice they deserve, justice presently far too often denied. Since the Corporate Manslaughter and Corporate Homicide Act (CMCHA) was introduced in April 2008 there have been over 150 deaths in work related incidents in Scotland (according to HSE statistics). In reality the lives lost because of health and safety failure are far greater than that. Every year thousands of families are robbed of loved ones dying from occupational diseases such as mesothelioma and other occupational cancers, others die in incidents falling within the responsibility of other regulators such as the Air Accident Investigation Branch, the Marine Accident Investigation Branch and the Office of the Rail and Road Regulator, many die in road traffic incidents directly related to work, while others are pushed to such depths of despair that they take their own lives. If we have so many deaths in Scotland related to work then you would expect those accountable to be punished for their crimes. Currently, they are not. Not one employer has been indicted on charges of Corporate Homicide in Scotland since the legislation was introduced, a clear indication that existing legislation is failing those who deserve justice and indeed the memories of those who have needlessly lost their lives. 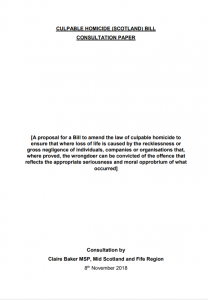 Claire Baker’s proposals seek to “amend the law of culpable homicide to ensure that where loss of life is caused by the recklessness or gross negligence of individuals, companies or organisations that, where proved, the wrongdoer can be convicted of the offence that reflects the appropriate seriousness and moral opprobrium of what occurred”. For Scottish Hazards this pretty much sums up what is wrong with existing legislation, it is not fit for purpose, a fact ignored by those in power in the United Kingdom who care more about burdens on business than the burdens inflicted on families by corporate killers; burdens that cannot, and should not be measured by economic impact but by the need to deliver equitable and natural justice. Leading up to the introduction of the CMCHA, former MSP Karen Gillon and trade unions questioned how effective the law would be due to a continuing requirement of a controlling mind test in order for guilt to be established. In the CMCHA this requires identifying failings of senior management in the way the company’s activities are manage,d as being a substantial part of the breach of the duty of care that led to the death. In Scotland this significant barrier to justice is compounded by the need to prove a mental element to a crime (mens rea) an added complication that perhaps explains why families are being denied justice. This goes far further than the position in England where the offence of Manslaughter can be established by an objective assessment of the conduct involved in the offence, in Scotland some assessment if the mental state of the accused is required in order to establish the guilty mind. As Claire Baker indicates in her consultation this makes it extremely difficult to attribute liability to a non-natural or legal person, such as a company or other organisation. As our board member and founder member of Families Against Corporate Killers, Louise Taggart said in her contribution at the launch of the proposals “these are not accidents, because an accident waiting to happen ain’t no accident”. We wholeheartedly agree, they are involuntary homicides and should be investigated, prosecuted in the same way as if the involuntary killing had happened in any town and/or community throughout Scotland. The power of our common law to punish, rehabilitate and deter should not stop at the factory gate. It is vital that organisations such as Scottish Hazards and trade unions develop responses to this consultation in the coming weeks, but perhaps more importantly, Claire Baker wants to hear from families impacted by tragedies at work and would welcome responses from them.